The Tray Platform gives us speed, agility, visibility, and cost savings. And better yet, it lets us be proactive with our marketing in a way that we couldn’t before. It has become a core part of our marketing infrastructure. It’s the fastest growing and the second largest cloud computing platform in the total number of public-facing apps and websites according to Netcraft. DigitalOcean, founded in 2011, is sailing full-steam ahead in its quest to be the top cloud platform for developers in the world. And with nearly one million registered users taking advantage of its simple and robust platform, DigitalOcean is well on its way. To help it maintain its phenomenal growth, DigitalOcean chose Salesforce as its customer relationship management platform. 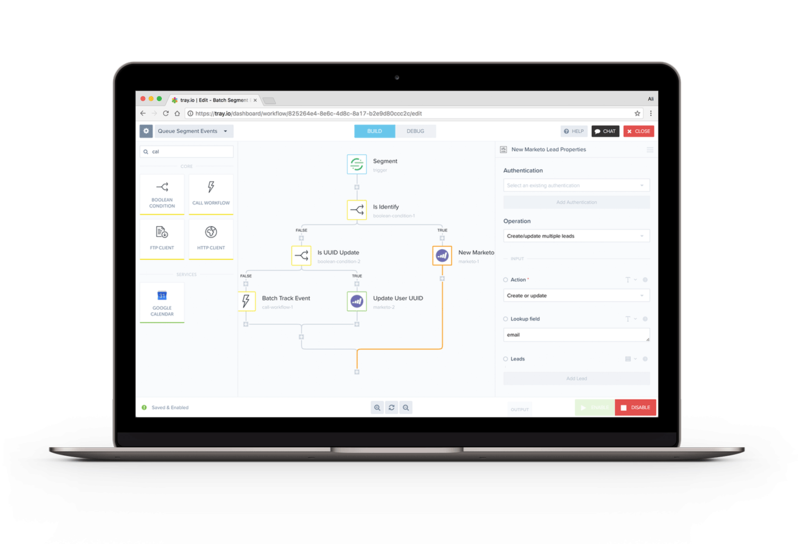 As the company rolled out Salesforce to its customer-facing teams, it began looking for a marketing automation tool that would work hand-in-hand with Salesforce. Marketo was selected by DigitalOcean in part because of the ability to integrate it with Salesforce. David Dorman, Director of Growth and Demand Generation at DigitalOcean, had a vision for connecting the company’s customer data platform (Segment) with Marketo and then connecting Marketo with Salesforce for a streamlined, efficient workflow. “Connecting the systems and workflow would let us be smart about how we communicate with users,” says Dorman. Because of the expense and amount of time it takes to develop a custom integration solution, Dorman knew that his team needed an automation tool that didn’t require developer resources. In fact, the DigitalOcean team already had what they thought would be the right tool for the job. However, as DigitalOcean prepared to deploy Marketo, it became clear that the original plan for integrating the systems was not going to work as the touted integration was not comprehensive enough, especially when it came to event segmentation. That’s when Dorman and his team turned to Tray.io. While the team at DigitalOcean was skeptical at first, it quickly realized that the Tray Platform could do everything that DigitalOcean needed and more. From Tray’s deep expertise in Marketo to its ability to handle data from millions of events per day from Segment, the integration platform vendor was exactly what Dorman’s team was looking for. DigitalOcean uses Tray to pull in data originating in its cloud platform and enrich the data with geolocation information. Tray then puts the enriched data into Segment, where it’s made available to other applications within DigitalOcean. Tray pulls data on email and onboarding tests from Segment and summarizes the results before putting them into Slack. Using Tray, DigitalOcean enriches Salesforce service cloud accounts with core data to provide a single source of truth for customer relationships. After starting small with one segment of accounts, DigitalOcean now enriches millions of accounts in Salesforce using Tray. DigitalOcean uses Tray to connect Segment and GetFeedback, and then automatically send customer satisfaction surveys within an active user base of more than a half-million customers. Tray creates Slack alerts based on form fills and status changes in Salesforce to create greater visibility into actions.